I already hear the question: How can I “know” I will be cured? Simple. Do you want to be cured? Then decide that you are going to get what you want and decide that you will put up with whatever you have to put up with in order to accept your cure. Simple in theory. Difficult in practice. Why? Because Parkinson’s is a symptom of your life out of balance, and until you restore balance to your life, the symptom called Parkinson’s will remain with you as a reminder that you have more work to do. So, you need to quiet your mind. And when your mind gets quiet, you open your heart and follow what you feel. The only thing telling you that what you are doing will not cure you, or your best is not good enough, or you are not worthy and deserving of being cured is your mind. Quiet your judgmental mind and be in your compassionate and loving heart, and you will KNOW you will be cured! In the beginning of my journey, I knew I would be cured one day. Sally knew it, too. I have asked my children if they ever thought I was afraid I would not be cured or ever thought I was concerned that the increasing symptoms meant I was getting worse. 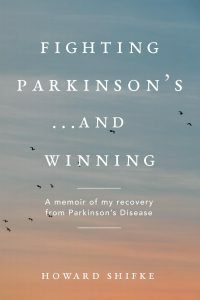 They all had a similar response: that I was so confident in my recovery, never showing fear of Parkinson’s or concern over increasing symptoms, and as a result, they were completely confident in my recovery as well. Quiet your mind. Know in your heart you will be cured. Do the Recipe. Make it happen. Be your own cure! Love and best wishes to you and Sally. Don’t tend to comment but follow the blog religiously and I have tremendous respect for your commitment to continuing to help others in the Parkinson’s fight. Dear Mr Howard, Greetings of the season! It’s quite sometime that I have made communication on my pd symptom. Well let me say with honesty that your blog on PD has served a purpose for patients. Even your current communique is impactful besides earlier ones. Your recipe is ultimate in recovery of Parkinsons manifestation. Spiritually I am confident for complete cure. Physically I am out of balance as aptly described in your recent blog. Only thing required at my end is sincerely and honesty towards thyself for which me and only me responsible. With your permission I would like to add that breathing exercises are of great help, for example inhale from left nostril and exhale by right nostril, then inhale from right and exhale by left, and do this starting with two minutes up-to 15 minutes later on. Meditation is of immense usefulness for more release of dopamine asper my internal happiness day and night. Howard Shifke Tyty so much for all the amazing care that you give to us. I’m am so grateful that I have found hope and your wonderful reminders are a true blessing. I find it a lively and light hearted bit of imagery. It always puts a smile on my face to think of it. Thanks for the comprehensive blog entry. I’ll have to really soak in this one to pull all the good stuff out of it. Oops, sorry, left out the best part! Not only does this wonderfully intelligent universe provide the stick (motivation), it also gives us with people like Howard and countless other teachers throughout the ages who supply us with all the tools we need to regain our balance. I LOSE the right to be ANGRY. I LOSE the right to be NEGATIVE. I CHOOSE to be ACCEPTING. I LOSE the right to be CONTROLLING. It’s outstanding, dear Howard, how you can explain complicated facts in a simple way, thanks!! Chris, your wise words are great! I, like you, have a wonderful husband – 35 years of wedded blitz haha! Thank you to Alex for his affirmation recording. I use it regularly to keep me focused. Hi Howard and fellow devotees! This message is amazing. Thank you so much. Thank you for providing us the tools we need to see the light at the end of the tunnel. Thanks to my husband for his undying support as I travel this path of PD recovery. Thanks so much Howard. Your posts are always so timely and so much appreciated. When I count my blessings and am thankful, you are a big part of that list. My life is still a bit out of balance but there are also positive changes to celebrate every day. Thank you. I choose faith, I am recovering.